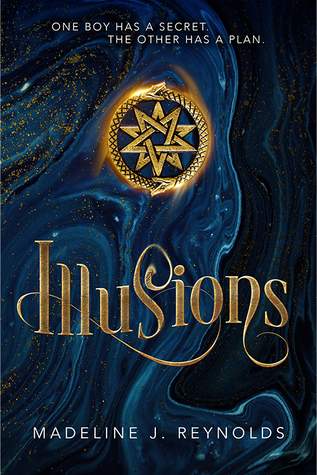 We're pleased to have Madeline J. Reynolds join us to chat about her debut novel, ILLUSIONS. Madeline, what is your favorite thing about ILLUSIONS? This is a really tough question because there truly are so many different elements of ILLUSIONS that I love – this really is the book of my heart. I loved telling the narrative through the epistolary format. I love the opposites attract love story. I love the magic woven into a historical time era. But I would have to say my favorite thing about the book is how Thomas uses the world of stage magicians and illusions to hide his magic in plain sight. I can’t really talk about the scene that was hardest for me to write without giving too much away, but I will say that writing the scenes where Thomas and Sav were physically intimate was something that I didn’t necessarily struggle with but rather, stressed over because I wanted to be sure I captured their romance well and did it justice. As far as scenes that I loved to write, I have particular soft spot in my heart for the scenes where Thomas embraces his magical abilities and uses them to create beautiful things. There is one scene where he creates an image of a tiny galaxy and another where he turns an empty bookstore into an enchanted garden of paper flowers. Those scenes were particularly fun to write. When people ask me about what my book is about, one of the first things I ask them is if they’ve seen the film, The Prestige. I ask this because I feel it would give them a good sense for what ILLUSIONS will be like with rival stage magicians in Victorian Era London, especially since one of the main characters has a pivotal secret. The film is of course based off of a novel by Christopher Priest. I would also say that fans of THE NIGHT CIRCUS would enjoy ILLUSIONS if they love magic and stage magicians woven into a historical setting. How long did you work on ILLUSIONS? The initial draft took about 8 months but the editing process has been much longer (over a year). As a writer, you’re always told to kill your darlings but I think with this book, especially going through the publishing process, I really learned to put that into practice without being afraid of the outcome. I will say that there are many elements of the book that are not the same now as they were in the original draft, including the ending, and I genuinely believe that the book is stronger for it. Madeline (Maddie) Reynolds is a writer based out of Chicago. Originally born and raised in Minnesota, she relocated to Chicago to pursue a career in writing and fell in love with the city. She began attending Columbia College Chicago, where she majored in Journalism with a focus in magazine writing & editing. She gained experience writing for various blogs and online magazines as a music journalist; covering live shows around the city, reviewing albums, interviewing artists, etc. but her true passion was always in storytelling. Ever since rediscovering her love of fiction writing, she has been very active in Chicago's literary community, taking various classes and workshops at StoryStudio in the Ravenswood neighborhood, volunteering at StoryStudio, joining a fantastic writing group centered around speculative fiction, attending the Chicago Writers Conference, etc. When she isn't writing, she loves going out to explore the city, spending time with her loving and supportive boyfriend, seeing live music, devouring Thai food, and marathoning the Lord of the Rings films. She is represented by Whitley Abell of The Jennifer De Chiara Literary Agency in New York. Have you had a chance to read ILLUSIONS yet? Do you worry about doing romantic scenes justice? Do you feel your writing gets stronger when you kill your darlings? Share your thoughts about the interview in the comments! I have read Illusions, and reviewed it on good reads. I absolutely loved it!